A stretchable pair of leggings always tops the list of essential clothing in a women’s world. More so because of the comfort and slimming effect that you get from it. Being very neutral in appearance the bottom wear offers myriad possibilities including professional and casual ensembles. White or beige long button-down shirts and black cotton leggings are a refined combination for corporate wear, especially during summer. A formal blazer or a round neck sweater on top of it would look lovely with leather leggings in winter. However, you may try skirted leggings to make it look like stockings. Since you are wearing the outfit to work, keep the shade light and sophisticated. 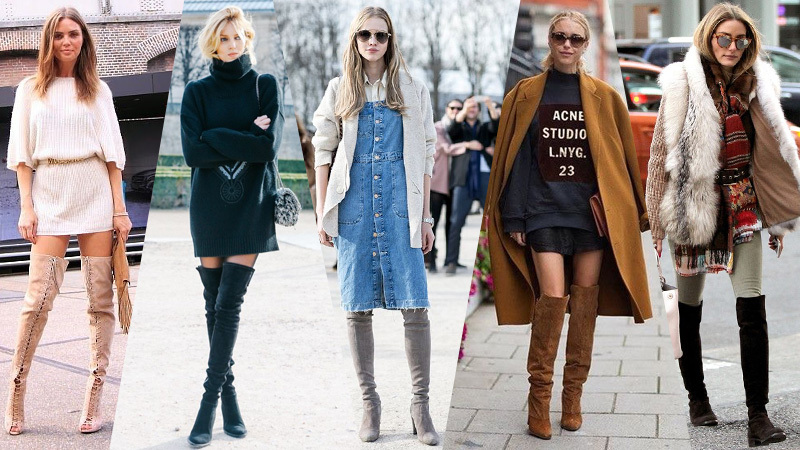 Comfortable long denim shirts (much like a denim tunic) and cotton leggings either in black, brown or tan make a deadly combination when you seal the deal with a pair of over-the-knee boots for an easy breezy weather. Cute plaid shirts with pockets provide a voluminous look to petite bodice while leggings slim down the heavy legs. An addition of leather boots makes your calf narrower. Full sleeves plus size shirt dresses cover up chubby arms, elaborate waistlines, and heavy bottoms when teamed up with dark-colored leggings like maroon, red, royal blue and burgundy. They also make a perfect outfit for fall. A brunch party or a movie day out with friends on a summer afternoon calls for cute asymmetrical tunics or blouses in solid shades and Nordic patterned leggings. Short women should go for vertical prints and long women can try anything their heart wants. Lace leggings are a nice choice for simple tops. Women with apple shape figure may try layering the upper wear with scarves or fur in winter and spring to balance with their slender legs. 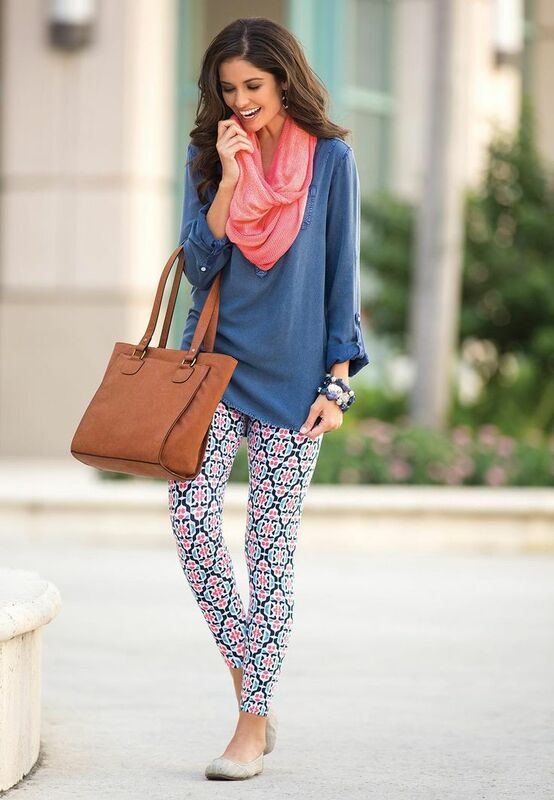 Tiny polka dots or small printed leggings are ideal as they highlight your feature without adding much volume. A belt on your full sleeve tunic along with houndstooth or floral printed leggings is a natty winter choice for accentuating an hourglass figure and also for women who are short as printed leggings elongate a figure. Tunics with chevron or flowery patterns lend a fuller and voluminous look to petite and smaller torso while simple leggings sans any embellishments highlight the slimmer bottom, creating an impression of a balanced figure. These mix and match makes decent outfits for women hitting 40’s and 50’s. For holiday festivals or traditional ceremonies like wedding, you can wear such dressy tunics and leggings combo. Extra long and stretchable maternity tunics or the short dresses that you no longer wear and leggings in monochromes ensure a comfortable look for all mom-to-be. For an evening stroll in a park, expectant women can go for this outfit. Short tops coupled with leggings have a major chance of fashion faux pass unless jackets and shrugs are incorporated. Especially during spring, crop or bikini tops and leather or cropped leggings gets well complemented with leather or denim jackets. For summer opt for crochet or cotton shrugs to cover your back. Peplum tops are a wise selection for disco metallic, leopard or high-waisted tartan printed leggings as the flowy end of the tops partially hides your rear and gives an appearance of a well-toned figure. Plus size women can also go for off shoulder flowy tops that will showcase their collarbone for a slimming effect. Graphic t-shirts and cotton leggings are a major fashion goal. Sadly, for a few women having a slender body. 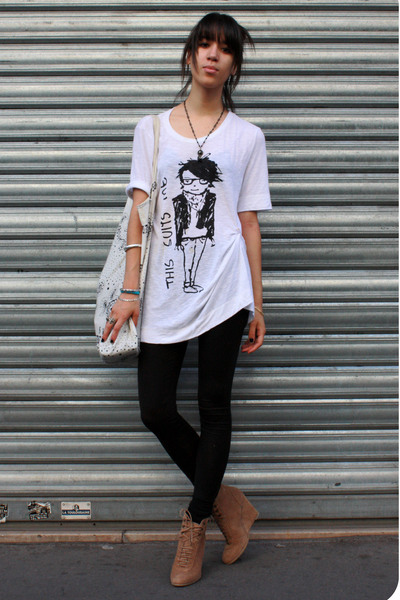 For a street style, opt for long oversized statement t-shirts. While for exercising at the gym, opt for sleeveless vests or tank tops with stirrup, yoga or mesh leggings for optimum comfort. Long button-down cardigans reaching your knee and leggings are a perfect duo. If you choose a cardigan with intricate designs like furry at the neckline and stone embellishments on the body, then opt for non-patterned leggings to highlight the former. Neon shade cardigans go well with gray, green, black or white knit or herringbone leggings. In case of army, elephant, emoji, tribal, Aztec or galaxy printed leggings, keep the cardigans simple and cute, it could feature a hoodie or the sleeves may vary, but anything more than that will ruin your entire look. Choose this outfit for a night out party with friends. Long sweater tunics are known for lending a slim silhouette, especially to plus size women. The itsy bitsy printed tunics are cozy and warm, even look so when paired up with velvet leggings. Asymmetrical tunics or sweatshirts made of chunky yarns, especially the ones with a waterfall style towards the bottom offer a balance to pear-shaped women. Ponchos and faux leather leggings complement each other when you complete the look with a pair of knee-high boots. Go for a block or chequered print in bold colors with pink or white leggings to showcase an appealing look. You can even wear them with skirts for a stocking like effects. For wearing something round the clock everyday, comfortable leggings are reliable and classy apparels. Styling them up in multiple ways with suitable footwear and accessories are easier when you follow the contemporary fashion rules along with a personal touch.